New St. Edward flood elevation map. 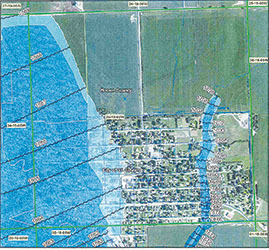 New flood elevation maps for the City of St. Edward have been announced by the Nebraska Department of Natural Resources. Mary Ziemba, county zoning and floodplain administrator, received the new maps last week. The maps were valid effective April 11. The effective flood zone includes the Beaver Creek near the west edge of town, as well as a drainage area through east part of town. Ziemba said the new maps substantially expand the community’s flood zones. On the map, the previous flood zones are shown in a darker shade, with the expanded flood zones in a lighter shade. Within the flood zones, all rebuilt structures or new structures must be built one foot above the base flood elevation. Ziemba reported statistics from the March 13 flooding in St. Edward. She has a file of more than 20 residences and six businesses that sustained over 50 percent damage. St. Edward City Council held a special meeting Monday, Thursday, April 11, and approved a resolution for an interlocal agreement with Boone County. Under this agreement, the county will assume administration of the city’s zoning, building permits and floodplain management. This interlocal agreement was also approved by the Boone County Commissioners on Monday, April 15.